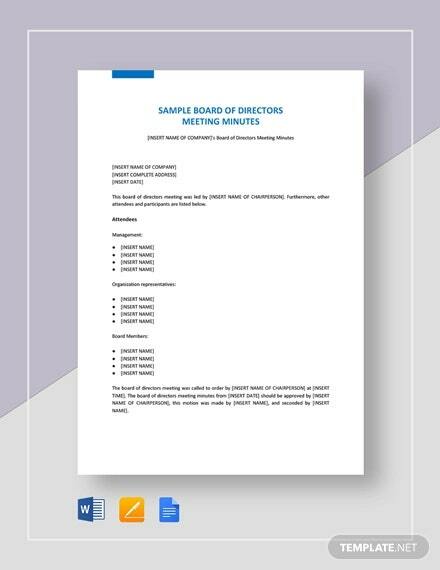 Board of Directors Meeting Minutes Template – 12+ Sample, Example Format Download! Business meetings and discussions involves a lot of pressure and stress that one needs to go through while making a final decision for a particular issue. Since meeting includes a lot of professionals and business stakeholders, each one of them having different mindsets and ideas, it becomes highly important to keep a track of everything that has been shared, discussed, or even fought upon. You may alse Sample Meeting Minutes Templates. Tracking the important headings and recording the quotes said by critical analyzers is imperative to ensure that you and your business progresses in the right direction. 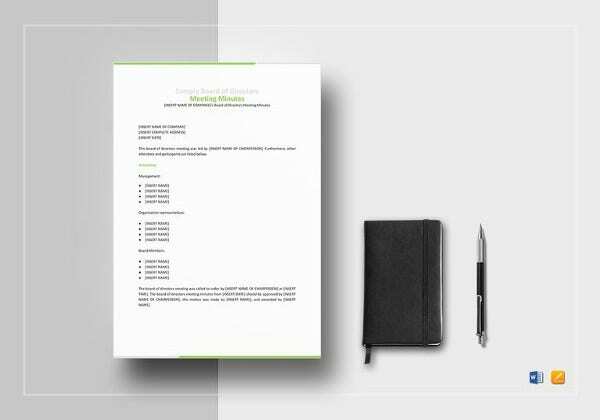 The Board of Directors Meeting Minutes Template serves as an ideal solution to record all the important findings of the meeting without taking any extra stress. You can easily record, create, and prepare detailed layout of the meeting minutes and share it across for future referrals. 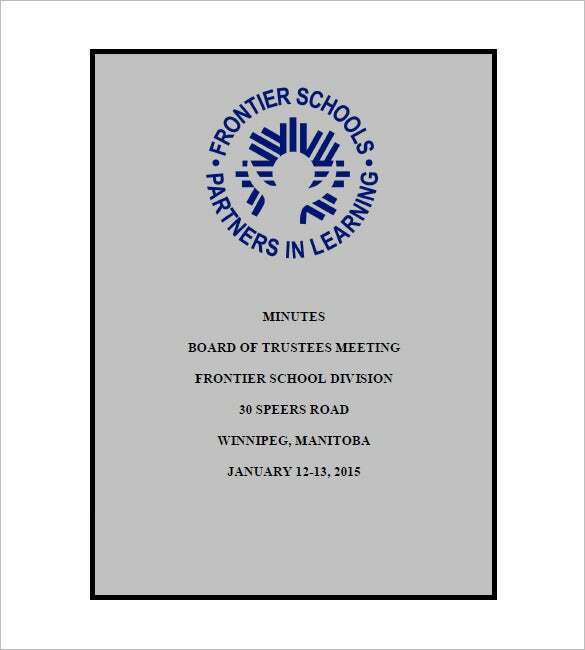 frontiersd.mb.ca| Board of Directors Meeting Minutes Template has a large space allotted for the logo followed by the minutes, and the meeting details such as location, date and timings of the meeting. 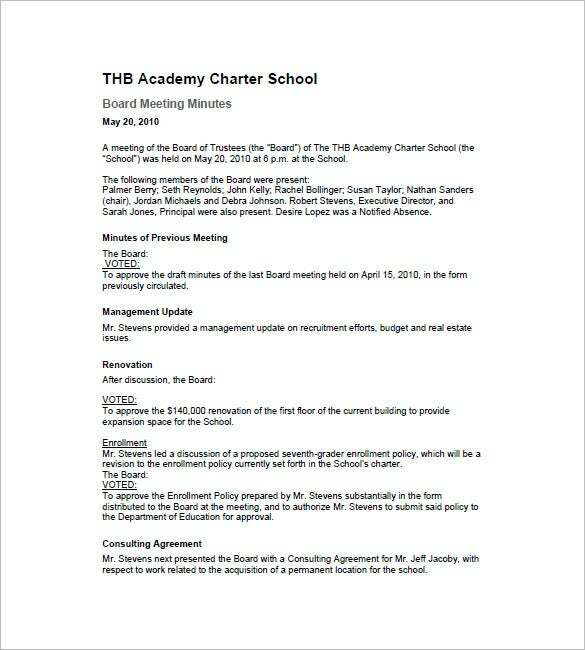 charterschooltools.org| The School Board of Directors Meeting Minutes Template is a well-defined template that helps you to record and monitor the thoughts shared in the general body meet and helps you trace down the progress of the projects discussed. The minutes of the meeting template enables you to record almost everything in detail along with the names of people who has quoted a particular instance or solution to the problem.You can easily customize the template to meet the particular culture and desired purpose of the organization’s meeting agendas. 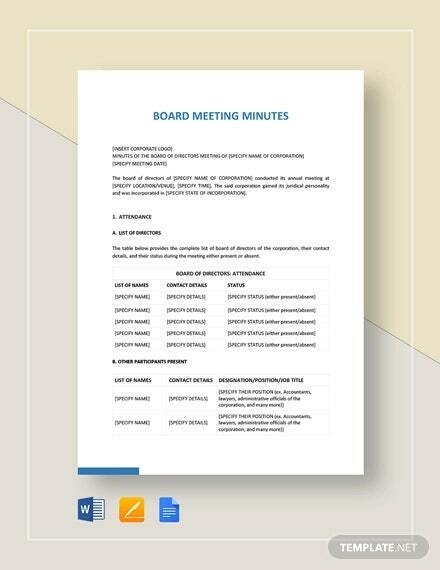 Since there is no standardized level of content and format for board minutes, this highly customizable and personalized meeting minutes template is ready to cater all your requirements associated with keeping a record of a particular school board meet. 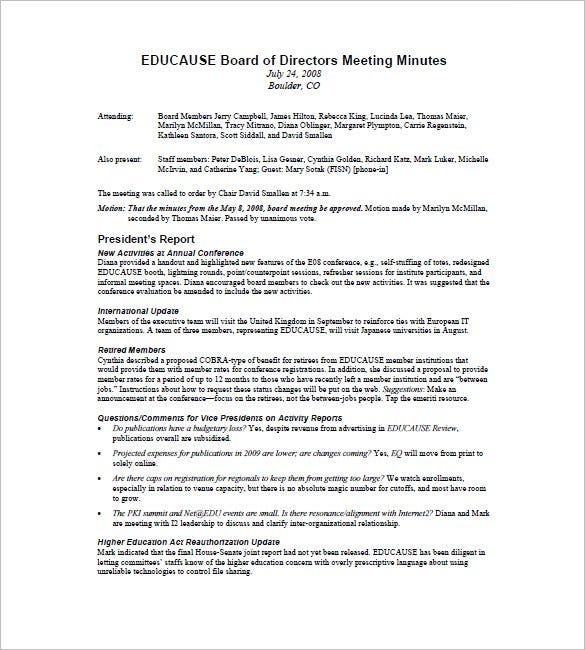 educause.edu|Board of Directors Meeting Minutes Sample gives attendants details and other members present followed by the president’s report and retired member’s details. 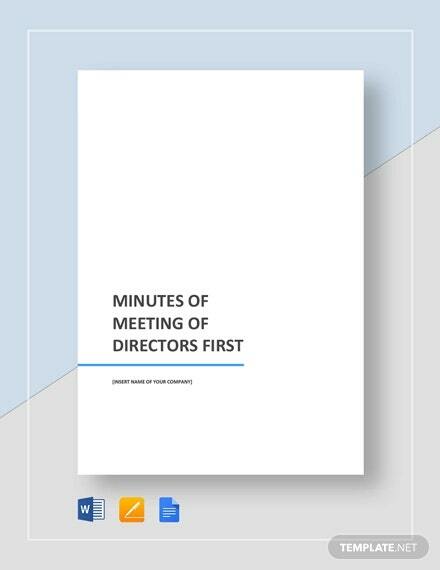 Board of Directors Meeting Minutes Template has a refreshing design that addresses the attendance, the president’s report, and consent agenda, amongst other details. 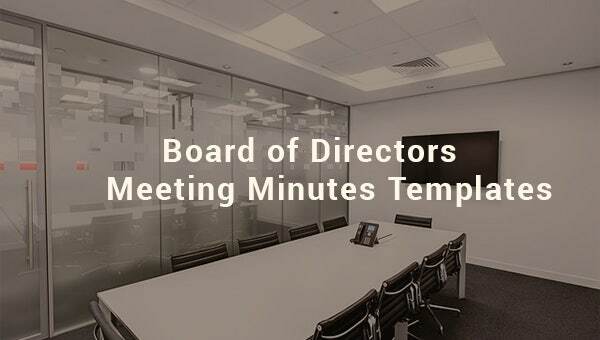 ecfa.org |The Church Board of Directors Meeting Minutes Template lists all the important and crucial items that are required to be discussed in meeting. 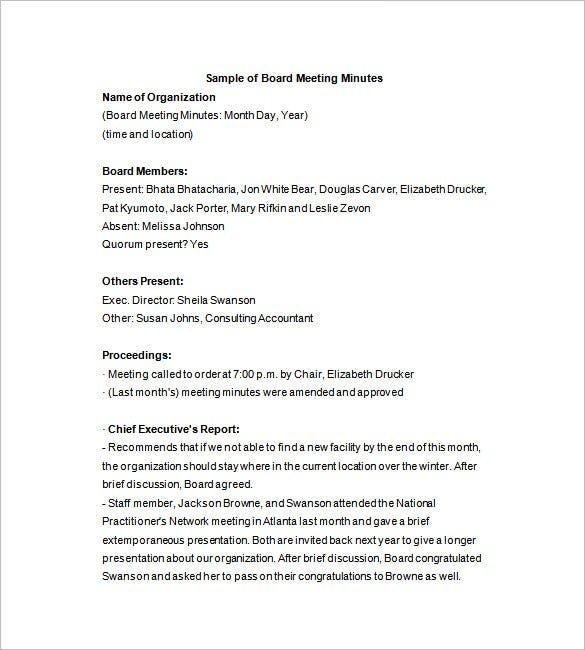 The template includes a lot of other layouts including free Board Meeting Minutes, Board Member Portfolio, Sign-In Sheets, Church Name Change Form, and other important templates to ensure that you do not find any hassle while noting down the important findings of the meet. 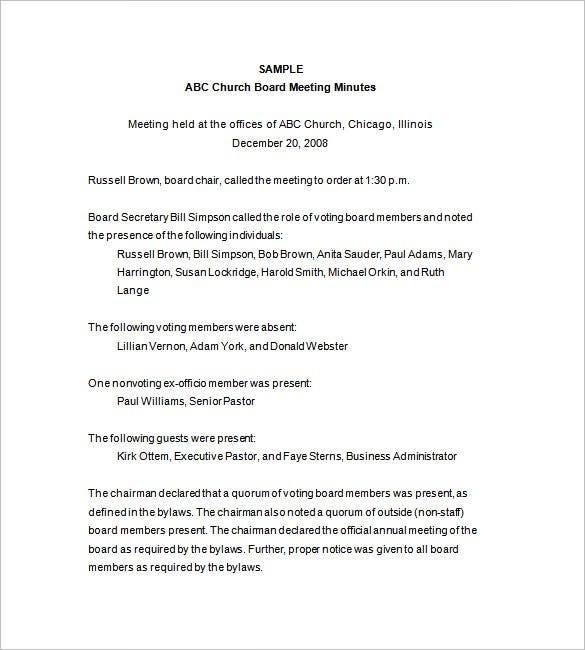 The board meeting minutes serves as a quick guide to the church board members and helps them to understand what all was discussed in the previous meet or session. Additionally, maintaining minutes of the meeting also helps you to avoid a prolonged, unorganized, and boring meeting with great ease. 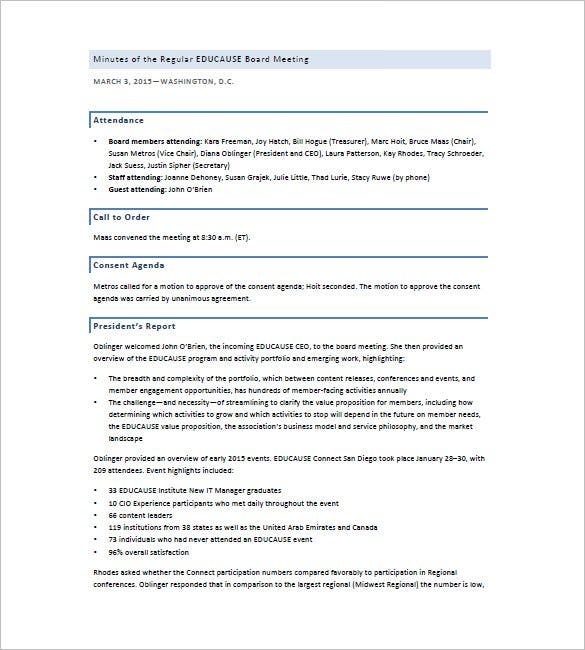 managementhelp.org|The Corporate Board of Directors Meeting Minutes Template is one of the best solutions to keep a track on all the important findings and notions of a particular business meet. 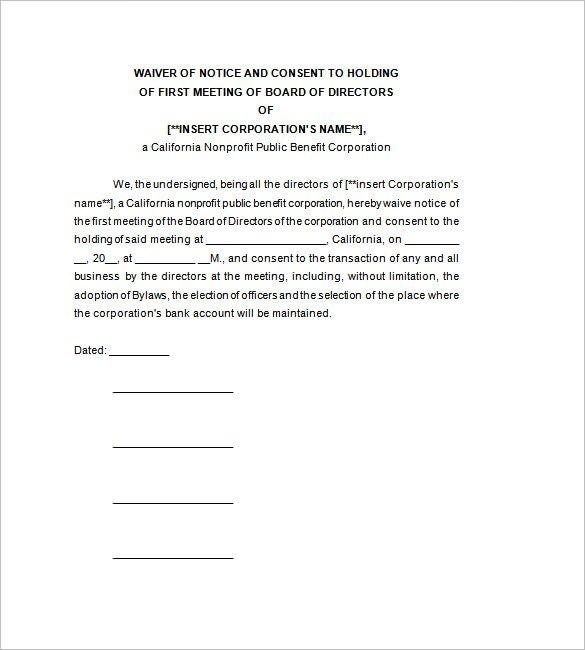 Since the board of directors for a corporation holds an annual meeting, you can easily use these templates to record and present the details of the past year without missing a single entry.Presenting a detailed meeting minute in the beginning of the corporate board meet helps all the stakeholders and business owners gain a quick recap of what all has been shared in the previous meet. Additionally, the detailed document also help them to decide on actions and strategies that the organization will be following in the next year to experience immense growth. Since we all live in a time where time is money, it becomes highly important to find out quick solutions of our day-to-day tasks for utilizing the manpower and resources on important factors. 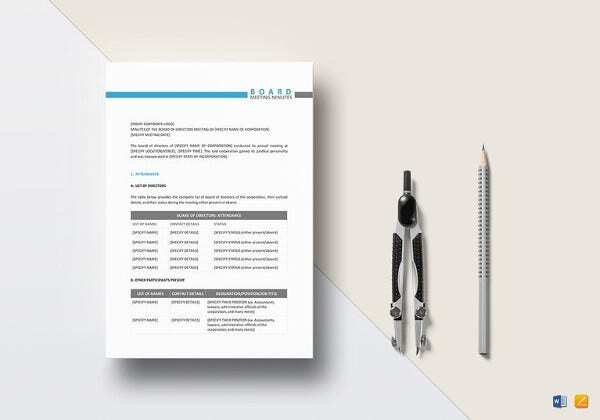 The readymade templates include all the necessary sections, segments and fields that you can fill out to obtain an effective and self-explanatory meeting minutes. With a help of these already made templates, you can easily roll out the meeting minutes soon after the meeting gets over. All you need to do is to put in the correct content and customize the template as per your preferences. All of these templates are available in various MS Word and Adobe PDFs versions to meet your desired purpose at large. It is important to consider that a board of directors meeting is indispensable, and you must record all the proceedings for future use. 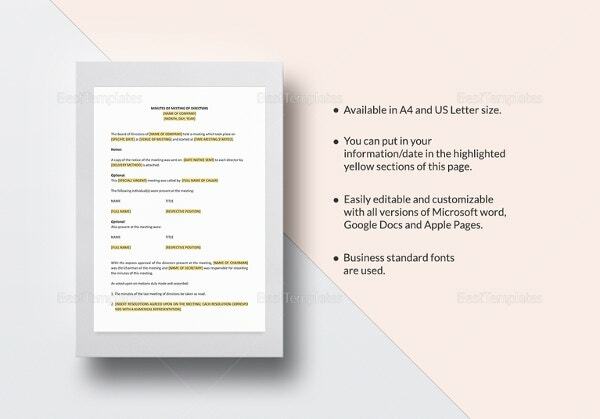 These templates enable you to get an attractive, professionally-designed, and detailed meeting minutes without spending a single dollar from your profits. Since there will be large number of free templates available over the web, you can easily choose the one you need and transform it as per your requirements. If you have any DMCA issues on this post, please contact us!